Artist’s project displays the incredible spectrum of human diversity – Technology… in PLAIN ENGLISH! 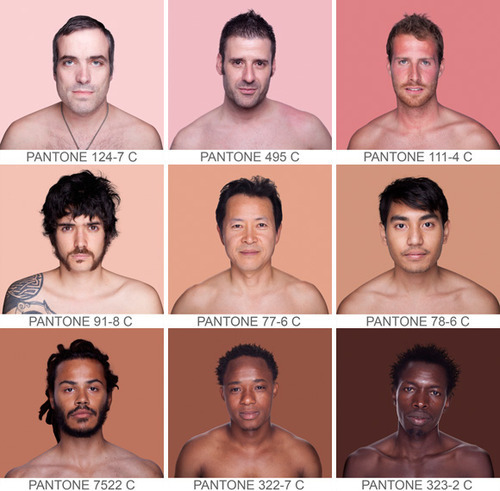 The Humanae Tumblr shows a collection of portraits taken against the background of a Pantone color that matches each subject’s skin tone. The Pantone system is one of the most popular and accurate color classification systems in the world, and each portrait is matched with a shade with an unique alphanumeric code that can be replicated in any media. Ok, is it just me or is upper right corner guy getting an unfair shake or raw deal (no pun intended)? A little too much sun seems to have led (probably) to an “off day” as far as his real skin tone. Does that mean he deserves Pantone 111-4 C? LOL. For a skintone, you really can’t say it’s common in everyday people — well, it’s a common color for a sunburned person. Poor guy. LOL.